Les Maslin is lucky he had a cardiac arrest at Noble Park Aquatic Centre. “I was up in my roof a couple of hours before that,” the Springvale South grandfather said. “I would have probably died up there. Instead, Mr Maslin was about 500 metres into his twice-weekly swim when he lost consciousness on 15 March. “Next thing I know I’m in Monash emergency,” he said. 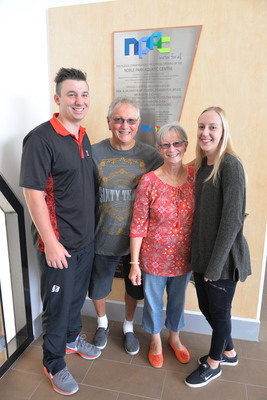 It was NPAC lifeguard Danielle Begg who removed him from the pool and duty manager Lochlan Norton who joined her to perform cardiopulmonary resuscitation (CPR) before emergency services arrived. “In total, apparently, there was 18 minutes of CPR and there were four lots of big zaps,” Mr Maslin said. The 66-year-old caught up with the life-saving duo about 10 weeks after the drama. “I’ve got them on my iPhone, a picture of the two of them, so I can say ‘these are my saviours, I owe an awful lot to them’,” he said. “I was in the hospital for eight days, basically getting the lungs cleared out and being fitting with a defibrillator. “That’s in the chest wall. That’s with me forever. “It’s not actually the plumbing side of it which was the problem, it was the electrical side. “I had no pains, I had no breathing difficulties. His cardiologist receives data from his defibrillator each day. “There’s a bit of security there,” he said. When he spoke to the Journal three months down the track, he had already built back up to swimming 24 laps. “My wife tells me that I still have the same wicked sense of humour. “I can’t say that I’ve noticed anything that doesn’t work anymore. He’s not allowed to drive for a while and his ribs took a hammering during CPR. “He didn’t break any of my ribs, but I’ve only really now got over the pain associated with the rib cage,” he said. “It seems that every part of your body is joined to your rib cage. Mr Maslin’s wife Sue was visiting his elderly mother in Noble Park when the drama unfolded. She received a call from NPAC and arrived while her husband’s life-saving treatment was still in progress. “I used to run a childcare centre so I know first aid, but there was nothing I could do except watch when I got there,” she said. NPAC YMCA manager Ansie Uys said that equipping staff with life-saving skills was the difference between a positive outcome and tragedy in this case. “We have numerous training sessions throughout the year to prepare us for how we would respond on the day,” she said.